For those of you who followed my advice yesterday based on the long legged doji of Monday I hope you made money from your short positions,which some of you may still have open today. Yesterday’s wide spread down bar simply confirmed the turning point highlighted by Monday’s doji which also confirmed the resistance now in place at 1.3745. The wide spread up bar of last week has caused a slight distortion of the moving averages and which makes their use of less value at the moment, as a result. 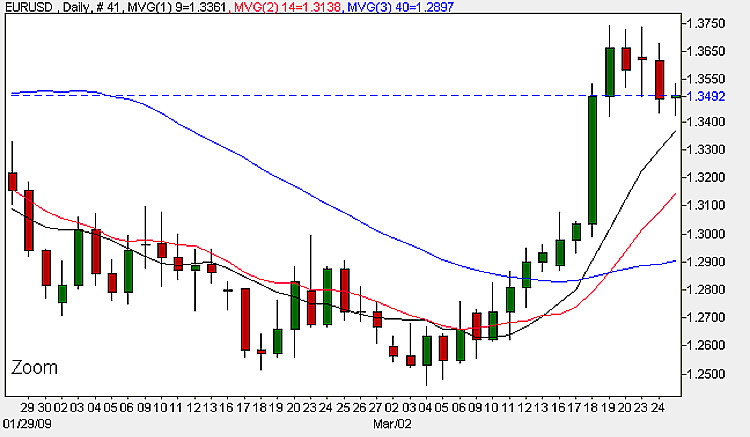 Under normal conditions a daily move of 200 pips would generally break through one or other of the moving averages. The question for today is should we continue on the short side or bank our profits and wait for prices to move below the 9 and 14 day moving averages. The fundamental news released in Germany this morning showed an economy in deep recession with figures being the worst in 26 years but surprisingly this had little effect on the euro because the market is now waiting for release of the key data in the Core Durable Goods index, new home sales and later on crude oil inventories, all of which I have covered in the more detail on the euro to dollar site. My suggestion for today is to leave any short positions in place, and lock in profits by moving your stop loss lower, and if you are looking to enter the market I would suggest waiting until after the Durable Good data has been released, which if better than expected along with home sales, could send the euro dollar lower in the next few minutes. To keep up with all the latest currency news, live currency charts, fundamental news, and the economic calendar please just follow the appropriate links.